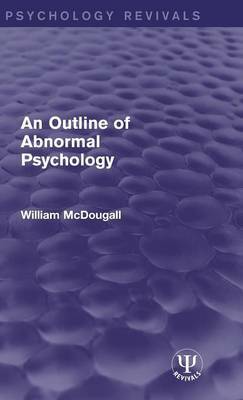 Originally published in 1926, a complement to the author's Outline of Psychology, this book surveys the field of neurotic and mental disorders in so far as they are not due to gross organic lesions. It discusses this principal types of mental process that are abnormal or disorderly in the sense that they are departures from the fully waking processes of the normal mind, seeking to understand them in terms of the general principles laid down in the earlier volume. Sleep, the influence of drugs and suggestion, conflict and repression, automatisms and somnambulisms, morbid fears, obsessions and impulsions, perversions, delusions, exaltation and depression, multiple personalities, psycho-therapy, and the schools of abnormal psychology - these and many others are the topics discussed from the point of view, not of medical practice, but of psychological theory. A book, not for the medical expert only, but for every man or woman interested in the riddle of human personality.